Britain was still recovering from the hardships of the Second World War when seamstress Irene Dove walked down the aisle of St Michael’s Church at Bishop Middleham in a dress she had designed and created herself to marry local farmer Charles Marshall. Photographs taken at the wedding in 1949 confirm that farmer’s daughter Irene, from East House Farm in the village, looked as pretty as a picture in her beautifully-embroidered, cream, crepe fabric wedding gown with its smocked shoulders and fitted waist and which she wore over a parachute silk underslip. On Saturday (May 12) that same dress will be back on show in St Michael’s Church as part of a special ‘Weddings Then and Now’ exhibition which is expected to attract visitors from many parts of the North. Irene went on to have four children. 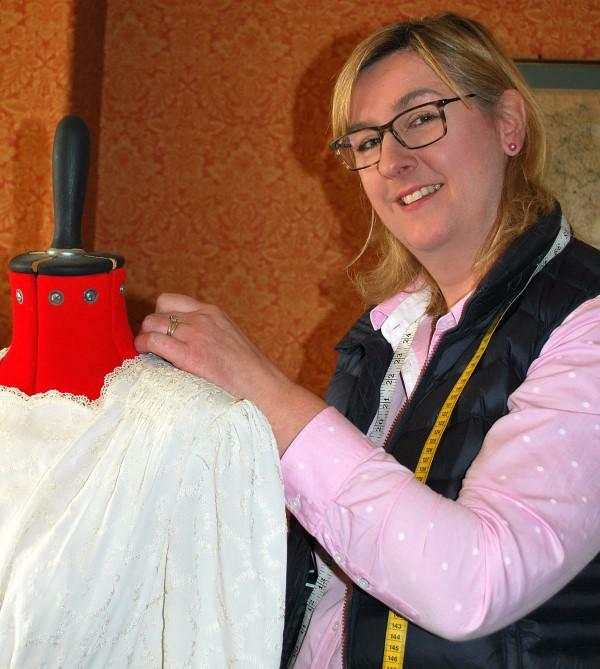 The youngest, Judith Wood, now lives at Merton Grange Farm in Stillington, and is pictured making final adjustments to the dress before it joins an eclectic collection of wedding memorabilia displayed in the church between 11am and 4pm. The exhibition will include stands from wedding service providers, wedding texts, poems and written anecdotes about specific weddings and wedding traditions, floral arrangements, children’s activities and crafts as well as refreshments – including wedding cake. Visitors will be able to try their hand at making a floral button hole and test their knowledge of ‘the happiest day’ in a wedding quiz. Entry is free but donations are being invited for St Michael’s Boiler Fund. Further information is available at thenandnow@talktalk.net or by calling 01740 654966.